It's hard not to consider J K Rowling one of the best. She's a legend in the genre of young adult fantasy and the Harry Potter books are some of the most well known in the genre! She spins a fascinating tale full of both dark and wonderful characters written to perfection. Totally addicting and easy to read again and again. It's no wonder she's one of the most popular children's author EVER, and so long as her books keep kids interested in reading I say there's nothing wrong with the almost cult like following she's built. It all started with an 8 year old boy named Harry Potter and a magical place called Hogwarts School of Witchcraft and Wizardry. From the very moment we delved into the pages of the first ever Harry Potter book, we were hooked. It's a story unmatched by any other and one we've read over and over. It didn't take long after that first book was published for J.K. Rowling to grow in popularity with readers of various ages. Harry Potter's hardships and adventures grow ever darker and much more dangerous as the series progresses, but the underlying story is a strong one and the characters are the kind kids can easily relate to and grow with as they find their way through the halls of Hogwarts. 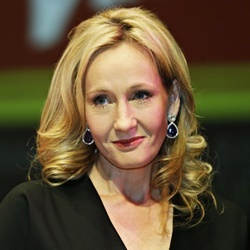 Rowling has been honored with many prizes and awards for her books, most notably the Anthony, the Hugo, the Bram Stoker and the Whitbread Children's Book awards, among others. John Flanagan is an Australian fantasy author who is best known for the Ranger's Apprentice series and Brotherband, both set in the same world and full of heroic action and adventure. Christopher Paolini is a young adult fantasy author and writer of the bestselling series the Inheritance Cycle. His books are full of epic adventure, excitement and intriguing characters, and they're a great read for fantasy fans of any age.